TALLAHASSEE, FLA — April is sexual assault awareness month and one local cafe is empowering survivors of sexual assault. 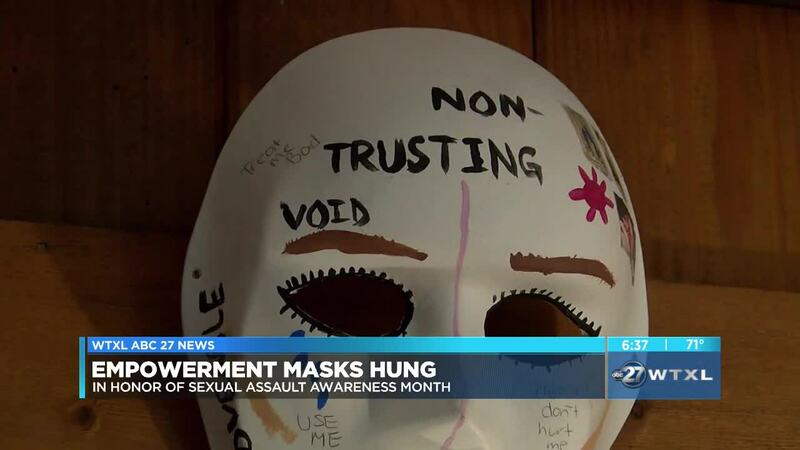 The Black Dog Cafe at Lake Ella will be hanging masks that have been designed by sexual assault survivors for the whole month of April. The Florida Council Against Sexual Violence says they reached out to Black Dog to display this project. The art pieces are called "Empowerment Masks" and represent the masks survivors wear as a result of their experiences. "It really is the sign of the courage and resilient of the survivors of sexual assault and I think it's a way to open up the dialogue that says "we won't be silenced and we won't be forgotten." It's a very difficult topic for a lot of people to discuss, and lot of people just want to sweep it under the rug, but for this it is a positive outlet for people to channel their pain into," said Audrienne Shifflette. According to the national sexual assault resource center, one in every five women and one in every 71 males will be sexually assaulted in their life.